Recruitment. DX indicates diagnosis; GAD, generalized anxiety disorder; NOS, not otherwise specified; PD, panic disorder; PDSS, Panic Disorder Severity Scale; PQ, Primary Care Evaluation of Mental Disorders (PRIME-MD) Patient Questionnaire; SIGH-A, structured interview guide for the Hamilton Anxiety Rating Scale. Observed main outcomes by intervention status. At 12 months, random regression group × time interactions were statistically significant for the following (clockwise from top left): structured interview guide for the Hamilton Anxiety Rating Scale (SIGH-A) (P = .03); Panic Disorder Severity Scale (PDSS)—full cohort (P = .02); PDSS—only patients with panic disorder or panic disorder/generalized anxiety disorder (P = .003); and SF-12 mental component summary score (SF-12 MCS) (P = .03). Context Panic disorder and generalized anxiety disorder are prevalent in primary care, associated with poor functional outcomes, and are often unrecognized and ineffectively treated by primary care physicians. Objective To examine whether telephone-based collaborative care for panic and generalized anxiety disorders improves clinical and functional outcomes more than the usual care provided by primary care physicians. Setting Four Pittsburgh area primary care practices linked by a common electronic medical record system. Patients A total of 191 adults aged 18 to 64 years with panic and/or generalized anxiety disorder who were recruited from July 2000 to April 2002. Intervention Patients were randomly assigned to a telephone-based care management intervention (n = 116) or to notification alone of the anxiety disorder to patients and their physicians (usual care, n = 75). The intervention involved non–mental health professionals who provided patients with psychoeducation, assessed preferences for guideline-based care, monitored treatment responses, and informed physicians of their patients’ care preferences and progress via an electronic medical record system under the direction of study investigators. Main Outcome Measures Independent blinded assessments of anxiety and depressive symptoms, mental health-related quality of life, and employment status at baseline, 2-, 4-, 8-, and 12-month follow-up. Results At 12-month follow-up, intervention patients reported reduced anxiety (effect size [ES], 0.33-0.38; 95% confidence interval [CI], 0.04 to 0.67; P≤.02) and depressive symptoms (ES, 0.35; 95% CI, 0.25-0.46; P = .03); improved mental health-related quality of life (ES, 0.39; 95% CI, 0.10 to 0.68; P = .01); and larger improvements relative to baseline in hours worked per week (5.7; 95% CI, 0.1 to 11.3; P = .05) and fewer work days absent in the past month (−2.6; 95% CI, − 4.8 to −0.3; P = .03) than usual care patients. If working at baseline, more intervention patients than usual care patients remained working at 12-month follow-up (94% vs 79% [15% absolute difference, 0.7%-28.6%]; P = .04). Conclusions Telephone-based collaborative care for panic disorder and generalized anxiety disorder is more effective than usual care at improving anxiety symptoms, health-related quality of life, and work-related outcomes. Given the benefits of actively treating PD and GAD, we considered Wagner’s chronic care model30 as a paradigm of treatment. 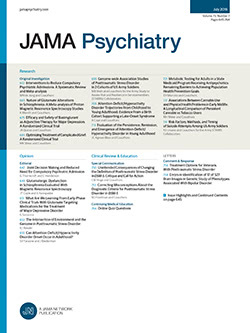 It suggests that clinical outcomes can be substantially improved by including active, sustained follow-up by a nonphysician health professional who adheres to an evidence-based treatment protocol under the supervision of a PCP with specialty back-up when necessary.31-33 The effectiveness of this collaborative care strategy has been shown in primary care settings for depression,34 congestive heart failure,35 diabetes,36 and asthma.37 However, few studies have investigated this strategy’s effectiveness at treating an anxiety disorder.21,38 Both focused on patients with PD and provided no information on employment patterns or utilization of health services. This research was conducted at 4 primary care practices administered by the University of Pittsburgh Medical Center, implementing a protocol approved by the institutional review board of the university. They included the university’s main urban faculty practice staffed by board-certified internists, and 2 suburban and 1 rural practice each staffed by nonacademic family practitioners. The practices shared a common EMR (EpicCare, Madison, Wis) whereby physicians obtained instant access to their patients’ medical information via computer terminals placed in each examination room. This EMR also facilitated physician and staff communications through an internal e-mail system. Study investigators presented highlights of our treatment algorithm at a 1-hour journal club conference and then met individually with PCPs to discuss the study. Twenty-seven physicians (100%) subsequently provided informed consent to enroll their patients. If the patient met criteria for PD and/or GAD, the research assistant confirmed that the patient (1) was not receiving treatment from a mental health professional; (2) had no history of bipolar disorder; and (3) had no plans to leave the study practice within the following year. If these conditions were confirmed, the research assistant attempted to obtain the patient’s signed informed consent to participate further upon confirmation of protocol eligibility. Afterwards, a trained assessor telephoned the patient to ascertain the presence of at least moderate levels of anxiety severity as defined by a score of 14 or higher on the 14-item structured interview guide for the Hamilton Anxiety Rating Scale (SIGH-A)46 and if so, to administer our baseline assessment battery. Within 8 months after we commenced recruitment, we obtained institutional review board approval to modify our protocol to administer both the SIGH-A and the 7-item Panic Disorder Severity Scale (PDSS)47 to all patients as we found the SIGH-A insufficiently sensitive to detect significant elevations of panic symptoms. Thus, all protocol-eligible patients with PD scored 7 or higher on the PDSS or had GAD alone or comorbid with PD and scored 14 or higher on the SIGH-A. We notified the patient’s PCP of the finding of PD and/or GAD on the PRIME-MD by means of an interactive e-mail alert (flag) generated through the EMR system and an electronic letter signed by the investigators. The messages also encouraged the physician to follow up with the patient to determine whether treatment was required. If the physician indicated agreement with the PRIME-MD, then a researcher entered the specific anxiety disorder into that patient’s electronic problem list. Based on prior reports concerning the efficacy of information feedback interventions to clinicians,40,48,49 we did not expect notification alone to produce significant and lasting clinical improvements. A statistician prepared computer-generated random assignment sequences. They allocated patients in a 3:2 ratio to either the intervention or the usual care group to permit sufficient sample sizes for analyses should physicians frequently disagree with the PRIME-MD. These sequences were produced in randomly set block sizes of 25 or 30, written on cards, and placed in opaque, sequentially numbered, sealed envelopes. The statistician opened an envelope following both the baseline assessment and physician agreement with the PRIME-MD. Since randomization was by patient, physicians cared for patients in both study arms. Given the nature of our intervention, neither patients nor PCPs were blinded to the treatment arm to which the patient had been randomized. For ethical reasons50 we informed usual care patients of their anxiety condition both orally and in a written letter signed by the investigators, and provided them a disorder-specific brochure on their anxiety diagnosis. However, we did not provide these patients or their physicians with any additional patient-specific treatment advice. We deliberately chose nonbehavioral health specialists—1 with an undergraduate degree in psychology and the other with a master’s degree in communication disorders—as our care managers to increase the generalizability of our methods to nonresearch settings. As described elsewhere,44 our 2 care managers telephoned each intervention patient to conduct a detailed mental health assessment, provide basic psychoeducation about PD and GAD as appropriate, and assess the patient’s treatment preferences for his/her anxiety disorder. Patients could choose any combination of the following treatment components: (1) a workbook designed to impart self-management skills for managing PD42 or GAD43 with care manager follow-up to review lesson plans; (2) a guideline-based trial of anxiolytic pharmacotherapy, primarily a selective serotonin reuptake inhibitor or serotonin-norepinephrine reuptake inhibitor, selected according to our treatment algorithm by patient preference, prior use, insurance coverage, and adjusted per patient response; or (3) referral to a community mental health specialist in keeping with the patient’s insurance coverage. We (B.L.R., M.K.S., C.F.R., and B.H.B.) conducted weekly 60- to 75-minute case review sessions at which the care managers typically presented all new intervention patients and follow-up on ongoing cases. To efficiently focus these sessions, we developed an electronic registry (Microsoft Access; Microsoft Corp, Redmond, Wash) which could identify the following: (1) all new patients followed by those whose anxiety symptom scores had not declined by 50% or greater from baseline; (2) individuals that the care manager contacted within a recent study period (eg, 2 weeks); and (3) all intervention patients to track the full cohort’s progress. We typically recommended a trial of pharmacotherapy or a dosage adjustment when the patient was symptomatically anxious and interested or already using pharmacotherapy. In these cases, we advised the care manager to recommend a specific medication name and dosage to the PCP and patient. We also made similarly specific suggestions to the doctor to change to a different anxiolytic when the patient demonstrated little response, and recommended referral to a mental health specialist in cases where the patient had either a poor recovery, complex psychosocial issues (eg, impending divorce), or where there was diagnostic uncertainty (eg, bipolar disorder). Following the case review sessions, the care manager forwarded patient-specific guideline-based treatment recommendations to the patient’s PCP via EMR for their consideration, and subsequently telephoned the patient at regular intervals to promote adherence with treatment recommendations and assess clinical response. The care manager also informed the physician of his/her patient’s progress, recommended modifications in the treatment regimen, and offered other assistance as indicated. For example, depending on the patient’s clinical response and treatment preferences, the care manager might recommend a mental health specialist consult, offer to assist in arranging the referral, and ascertain the patient’s adherence with this recommendation. However, the physician was always free to accept or reject these recommendations. Additionally, the care manager referred patients to specific relevant sections in the workbooks and reviewed these lesson plans during the follow-up telephone contacts to confirm that patients understood the text and could perform the relevant exercises, if any. Approximately once per month, the project coordinator (B.H.B.) and principal investigator (B.L.R.) reviewed a report generated on patients whose SIGH-A, PDSS, or Hamilton Rating Scale for Depression (HRS-D) score exceeded 25% of their baseline score on a recent, blinded, follow-up assessment. They reviewed each patient’s electronic medical record and alerted his or her physician via EMR to this finding if the clinical situation warranted (eg, no scheduled follow-up appointment). Furthermore, whenever an assessor or care manager uncovered suicidality, we immediately notified a patient’s physician and a study psychiatrist provided treatment advice. We conducted telephone assessments at baseline, 2, 4, 8, and 12 months following recruitment. We used videotapes, manuals, and practice interviews to train our assessors who were blinded to a patient’s randomization status. The assessors were instructed to remind the patient at the start of each follow-up call not to divulge whether he or she had been in contact with our care managers or whether he or she was using our workbooks. Patients were reimbursed $20 for each completed assessment and $50 for our 12-month follow-up assessment ($130 total). At baseline, we assessed self-reported sociodemographic status; determined mental and physical health-related quality of life using the mental and physical component summary scores of the 12-item Medical Outcomes Study Short Form (SF-12 MCS and SF-12 PCS, respectively)51; determined the presence of major depression using the PRIME-MD39; and determined the severity of depressive symptoms using the 17-item HRS-D.52 We assessed self-reported pharmacotherapy and mental health specialty visits, emergency department usage, hospitalization for any cause, and employment status at each telephone follow-up assessment. The number of care manager contacts and workbook use was calculated using the care managers’ electronic registry. A study nurse abstracted each patient’s electronic medical record to determine the number of office visits and telephone contacts that each patient had with his/her PCP over their course of follow-up. Our primary outcome was anxiety symptoms as assessed by the SIGH-A. Secondary outcomes included panic symptoms as measured by the PDSS, mental health-related quality of life, depressive symptoms, health services utilization, and employment status over the 12-month period of study enrollment. Using criteria employed by Barlow et al23 and Roy-Byrne et al,21 we defined a 40% reduction from the baseline level of anxiety symptoms as a significant treatment response. Thus, we required a sample size of at least 190 patients to detect a 30% group difference (60% vs 30%) in the proportion of randomized patients experiencing a 40% or greater reduction in symptoms on the SIGH-A, assuming a 2-tailed α = .05, β = .10, 15% patient attrition, and allocation of intervention and usual care patients in a ratio of 3:2. We present baseline data on sociodemographic status, type of anxiety diagnosis, symptom severity, functional status, and current treatment for an anxiety disorder grouped by intervention status. We compared baseline sociodemographic, diagnostic, symptom severity, functional status, and treatment for an anxiety disorder by intervention status using t tests for continuous data and c2 analyses for categorical data. We employed random regression models to account for between subject variations and to permit inclusion of patients with 1 or more missing follow-up assessments in order to examine the impact of the intervention on our continuous measures for anxiety and health-related quality of life.53 We also adjusted for the effects of the possible resolution of depression by using HRS-D in the random regression models as a time-dependent covariate that was measured during follow-up assessments. In these models, intercept and time were considered as random effects and group, group × time interaction, and HRS-D scores were considered as fixed. The usual missing at random assumption was tested by a thorough investigation of the reasons for dropouts, a sensitivity analysis using the test for missing completely at random mechanism,54 and a parametric test for the possibility of data not missing at random.55,56 These missing values consisted of dropouts from the study and intermittently missing visits (subjects returned at a later follow-up point). The reasons for dropouts at different follow-up points did not indicate any relationship with the observed values of any of the 3 outcome variables. Moreover, the missing completely at random test54 was satisfied for the SF-12 MCS measure and the results of the random regression analysis for the SIGH-A measure was similar in a sensitivity analysis using a logistic dropout model that included no effect of the previous outcome (missing completely at random), the effect of the previous outcome (missing at random), and the effect for a current, possibly unobserved outcome (not missing at random).55,56 These results supported our likelihood-based ignorable method for random regression modeling used in the SAS statistical program (SAS version 8.2; SAS Institute Inc, Cary, NC). The primary test of our intervention’s impact on patient outcomes was the interaction of intervention groups by time. We calculated absolute differences in scores and the effect sizes of our intervention compared with usual care at the 12-month follow-up. The 40% reductions at 12-month follow-up from the baseline levels of anxiety symptoms were calculated from the fitted random regression models using the estimated scores. We included all randomized patients in our intent-to-treat outcome analyses with 95% confidence intervals (CI). Given the specificity of the PDSS for assessing panic symptoms, we repeated our primary outcome analyses on anxiety subgroups. Since few patients had PD alone on the PRIME-MD, we included those with comorbid GAD in our analysis of patients with PD. We used Wilcoxon nonparametric rank sum tests to examine differences in health services utilization between treatment conditions given the nonnormal underlying distribution of our data. All analyses were performed with SAS statistical software. Patient recruitment data are shown in Figure 1. Overall, 59% (170 of 288) of those who met criteria for GAD on the PRIME-MD scored 14 or higher on the SIGH-A, and 68% (106 of 155) of those who met criteria for PD scored 7 or higher on the PDSS.57 We randomized 191 patients to either our intervention or usual care control condition, and these study groups were similar on all baseline characteristics (Table 1). Later, 2 patients (1%) died of nonsuicide causes and 21 patients (12%) withdrew from our protocol (16 [14%] intervention and 5 [7%] usual care; P = .35). Of the 191 patients, 135 (71%), 128 (67%), 125 (65%), and 143 (75%) completed their 2-, 4-, 8-, and 12-month follow-up assessments, respectively. Overall, 90% (172 of 191) completed 1 or more follow-up assessments and these patterns did not differ by study arm. During the first 6 months following study enrollment, intervention patients had a median of 7 care manager telephone contacts (range, 0-25) and 79% had 3 or more contacts (Table 2). Eighty percent of patients accepted the anxiety self-management workbook. Of these, the care manager made 3 or more registry notations regarding workbook use for 82% (76 of 93) of these patients. Although intervention patients self-reported a higher rate of pharmacotherapy usage for a mental health problem at 2-month follow-up than usual care patients (65% vs 41%; P = .006), it did not differ at our other follow-up assessment points. Furthermore, the proportion of patients who self-reported visiting a mental health specialist also did not differ by treatment assignment. Figure 2 shows the longitudinal course of anxiety symptoms and mental health-related quality of life. Compared with usual care patients, intervention patients reported a greater reduction in anxiety symptoms (group × time interaction) on the SIGH-A (P = .03) and PDSS (P = .02), and increased mental health-related quality of life on the SF-12 MCS (P = .03). Thirteen usual care patients missed their 8-month follow-up visits, but completed a 2-month or a 4-month assessment. Their 12-month scores were similar to their 2-month and 4-month follow-up scores, whichever of the 2 were available. Therefore, we attributed the observed increase in mean SIGH-A and PDSS scores for usual care patients from 8 to 12 months of follow-up and lower mean scores observed at 8-month follow-up to these missing assessments. We performed additional random regression analyses using time as a class variable to explain this apparent nonlinearity in the trend and found similar effect sizes. As shown in Table 3, our intervention produced a small-to-moderate effect size improvement in 12-month scores on the SIGH-A (effect size [ES], 0.38; 95% CI, 0.09-0.67), PDSS (ES, 0.33; 95% CI, 0.04-0.62), and SF-12 MCS (ES, 0.39; 95% CI, 0.10-0.68), and a moderate effect size improvement for panic symptoms on the PDSS (ES, 0.57; 95% CI, 0.18-0.96) among those with PD or PD/GAD. However, we observed no differential effect from our intervention on either SIGH-A or SF-12 MCS scores for those with GAD alone. Our intervention also had a similar impact on the proportions of patients who experienced a 40% or greater decline in anxiety symptoms from baseline (eg, SIGH-A full cohort 65.5% vs 34.7%; P = .001) (Table 4). Compared with usual care patients, intervention patients experienced greater reductions in 12-month HRS-D scores (ES, 0.35; 95% CI, 0.25-0.46) (Table 3) and they were more likely to experience a 40% or greater decline in depressive symptoms from baseline (P<.001)(Table 4). Intervention and usual care patients had similar rates of office and telephone contacts with their PCPs over the 1-year course of follow-up (Table 5). Although these rates did not differ by intervention status or across study sites, a sizable minority of study patients either visited an emergency department (41.6%; 79 of 190) or were hospitalized (20.5%; 39 of 190) over the course of follow-up. Furthermore, usual care patients were more likely to report 2 or more visits to an emergency department compared with intervention patients (23.0 vs 11.2%; P = .03). Of the 143 patients who completed a 12-month follow-up assessment, those randomized to the intervention reported an absolute improvement of 5.7 more hours worked per week (P = .05) and 2.6 fewer work days absent in the past month (P = .03) from baseline than those randomized to usual care (Table 6). Of the 91 patients who were employed at baseline and completed a 12-month follow-up assessment, intervention patients were also more likely than usual care patients to: remain working (94% vs 79%; P = .04); work more hours per week (40.5 vs 31.7; P = .03); and report fewer work days absent in the past month (1.1 vs 2.7; P = .05) at 12-month follow-up. Compared with the outcomes achieved by PCPs’ usual care for PD and GAD, our telephone-based collaborative care intervention significantly reduced anxiety and depressive symptoms, improved mental health-related quality of life, and improved employment patterns over the 12-month course of follow-up. These favorable outcomes were achieved without increasing the number of physician contacts by patients compared with our usual care control condition. To the best of our knowledge, this is the first reported use of a collaborative care strategy that (1) addressed GAD either alone or comorbid with PD; (2) relied exclusively on telephone contacts with patients by non–mental health professionals; (3) utilized an ambulatory EMR system to facilitate communications between centrally located care managers and geographically dispersed PCPs at several practice locations; and (4) reported work outcomes. Our intervention strategy was less successful at reducing anxiety symptoms or improving health-related quality of life among patients with GAD alone. Nevertheless, its feasibility, effectiveness, and convenience for physicians has implications for dissemination across other large health care systems, and rural and urban inner city settings lacking sufficient mental health specialty coverage.58 Indeed, although our care managers used an EMR system to rapidly communicate with physicians, it was not essential to our intervention as they could have communicated with physicians via mailed letter, telephone, or fax. This report also quantifies the adverse impact of PD and GAD on primary care patients’ health-related quality of life, health services utilization, and work-related outcomes. While responder bias could have possibly influenced our study findings on measures of anxiety and health-related quality of life, particularly at 12-month follow-up, the improved employment patterns among intervention patients and their reduced emergency department usage argues against this. Rather, we speculate that our observed outcome differences stemmed from our care managers’ engagement with patients, guided use of the anxiety workbooks, and feedback to patients’ PCPs, given that there was little differential usage of pharmacotherapy or mental health specialty visits between study arms. Furthermore, symptom differences between study arms increased over time, thereby suggesting that treating anxiety disorders takes time, patience, and relationship building. Our study adds to prior findings about the effectiveness of collaborative care at improving clinical outcomes for an anxiety disorder. Roy-Byrne et al21 randomized 115 primary care patients with PD to either (1) their physicians’ usual care; or (2) an educational videotape and brochure followed by in-person and telephone contacts with a study psychiatrist who prescribed a selective serotonin reuptake inhibitor free of charge, and forwarded typed consultation notes to patients’ physicians. At the 12-month follow-up, 80% of intervention patients vs 59% of usual care patients experienced a 40% or greater reduction in PDSS baseline score (P = .05). Our patients with PD had similar 12-month follow-up outcomes, but they obtained their pharmacotherapy through their insurance coverage and our non–mental health professional care managers never met face-to-face with any study patient. In another study, Roy-Byrne et al38 randomized 232 primary care patients with PD to either a structured 6-session face-to-face course of cognitive behavioral therapy with telephone-delivered follow-up booster sessions and pharmacotherapy, or to usual care. Unlike our protocol, they recruited patients exclusively from a university setting and utilized masters- and doctoral-level behavioral health specialists. Roy-Byrne et al reported 12-month follow-up improvements on selected measures of anxiety and depressive symptoms (eg, Anxiety Sensitivity Index ES, 0.43; P<.001), but no significant intergroup differences at this time point in mental health-related quality of life (SF-12 MCS ES, 0.12; P = .28) and rates of anxiolytic pharmacotherapy (eg, 54% vs 52%). We are unaware of prior reports linking successful treatment of an anxiety disorder within the primary care sector to any employment outcome. However, our findings can be compared with those of Schoenbaum et al,59 who reported a 5% absolute improvement in employment at 2-year follow-up, and Rost et al,60 who reported a 28% reduction in absenteeism at 2-year follow-up among consistently employed primary care patients receiving collaborative care for depression. Our findings support the business case model for implementing collaborative care strategies for PD and GAD in primary care settings. Still, we caution that additional studies are required to (1) clarify whether the greater absolute improvement in employment and reduction in absenteeism seen in our trial compared with other reports was attributable to differences in the population studied, our intervention strategy, or some other variable; (2) examine the impact of our intervention on work productivity61; and (3) confirm our results. Our study has several limitations potentially affecting the generalizability of our findings. First, we stationed dedicated patient recruiters in study practice reception rooms to administer, score, and collect the PRIME-MD. Although acceptable within the context of a research study where obtaining signed informed consent is required, such case identification procedures may not generalize to routine practice. Second, we were unable to complete a blinded telephone assessment for 25% to 33% of randomized subjects at each follow-up interval. However, our follow-up assessment rates did not differ by study arm and met statistical criteria for missing at random. Furthermore, we conducted a detailed review of dropout reasons and found no relationship between them and subject outcomes. Third, anxious individuals commonly self-medicate their symptoms with alcohol,62,63 but we deliberately excluded patients at high risk of an alcohol use disorder. Fourth, we lacked detailed claims data to confirm patients’ self-reported use of mental health specialists, accurately estimate the cost of our intervention, or calculate any potential cost offset. Although we estimate these costs to resemble those for telephone-based collaborative care for depression41,64 and the $301 median total outpatient cost per treated patient with PD reported by Katon and Roy-Byrne et al,65 our cost reductions may be even more favorable since we did not employ costly nurses or mental health professionals to deliver our intervention. Fifth, we administered a simple measure of employment status rather than one of the more advanced sophisticated instruments presently available.61,66 Sixth, the same physicians cared for patients in both treatment arms. Yet, despite the potential for a spillover effect that could have diminished outcome differences between study arms, our intervention strategy consistently generated a small to medium effect size67 across our main outcome measures that resembled the 0.33 (95% CI, 0.16-0.49) pooled effect size for 24 depression disease management programs.68 Finally, our findings may apply only to Caucasians who comprised 95% of the study patients. In summary, our telephone-based collaborative care strategy for delivering guideline-based care for PD and GAD significantly improved a broad range of anxiety, depression, mental health-related quality of life, and employment outcome measures at the 12-month follow-up. Moreover, the intervention was effective within naturalistic practice conditions. Although refinements to our treatment strategy are necessary to enhance its efficacy, particularly for patients with generalized anxiety disorder alone, our findings have key implications for other large health care systems, employers, and rural and urban inner city settings presently lacking mental health specialists. The attention devoted in recent years to improving the quality of primary care for depression through collaborative care strategies similar to ours may also raise awareness among health plans, insurers, and employers for the need to implement effective treatment strategies for these conditions that are highly comorbid with depression and overlap in their pharmacotherapy. Correspondence: Bruce L. Rollman, MD, MPH, 230 McKee Pl, Suite 600, Pittsburgh, PA 15213 (rollmanbl@upmc.edu). Submitted for Publication: February 11, 2005; final revision received May 25, 2005; accepted June 3, 2005. Funding/Support: This work was supported by the National Institute of Mental Health grant R01 MH09421. Previous Presentation: This study was presented in part at the Society for General Internal Medicine’s 27th Annual Meeting; May 13, 2004; Chicago, Ill. Acknowledgment: We gratefully acknowledge assistance with manuscript preparation by Jessica Minydzak; the methodologic and statistical input of Barbara Hanusa, PhD, in the conceptual stage of our study and at the start of our trial; Terry Sefcik who provided data management expertise throughout the study; Grant Shevchik, MD, site principal investigator at our 3 non–university-affiliated study practices who provided access to his fellow primary care physicians and their patients; and Wishwa N. Kapoor, MD, site principal investigator at our university-affiliated study practice and for his steady support throughout the project.